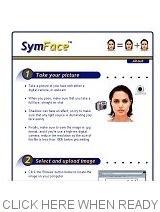 SymFace is a simple and fun way to see how your face would look if it was perfectly symmetrical. Before you start, you'll need to take a picture of your face with either a digital camera, or a webcam. When you pose, make sure that you take a full face, straight on shot. Then make sure that if you use a high-res digital camera, you reduce the size of the file to less than 100k in size before proceeding. Ned May has created a great little program for generating symmetrical designs. Click on the picture to download the program (~500K), then once downloaded just click on the file to unzip to wherever you'd like it. Nice job, Ned! © 2002-2012, Symmeter.com. All rights reserved.